Before Atkins, South Beach and Paleo, there was the Rice Diet. Shelley Winters, Lorne Green and Buddy Hackett — all big-name entertainers of their day — made the pilgrimage to take part in the residential weight-loss program that started at Duke University's medical center. Built around a regimen of white rice and fruit, the Rice Diet became one of the country's best-known diet centers in its more than 70 years of operation. It split from Duke more than a decade ago but in recent years, its customers dwindled as other diet approaches and stomach surgeries became popular. After attempts to reinvigorate the brand, the Rice Diet in November closed the doors on its residential, medically supervised weight-loss program. Owner Dr. Robert Rosati was unable to close a sale with any of three potential buyers to restart the program, and the center remains closed. "I think the whole business was challenged during the hardest part of the recession, and also my husband was ready to retire," said Rosati's wife, Kitty, who authored books including "Rice Diet Solution." Still, the weight loss approach that helped make Durham a destination for dieters is likely to live on in different form. Kitty Rosati says she and her husband want to lead health retreats using the Rice Diet Program brand name. Meanwhile, a businessman is aiming to start a separate weight-loss center using many of the diet's principles and employing former Rice Diet staff members. "The thing about nutrition is you blink your eyes and things change. People are looking for the freshest, the hottest, the latest, the greatest. The Rice Diet is nutritionally sound," said Amy Jamieson-Petonic, a registered dietitian and spokeswoman for the Academy of Nutrition and Dietetics. "Because it's not the latest and the greatest, I'm wondering if it kind of fell out of popularity." Any low-calorie diet will improve most measures of health, but "most people simply cannot follow low-calorie diets for extended periods, much less their lifetimes, as they are continually hungry," said Loren Cordain, the author of "The Paleo Diet," which advocates for eating like Stone Age humans and shunning cereal grains, potatoes and salt. High-protein, low-carb plans like the Paleo Diet tend to do better at increasing the full-stomach feeling, reducing appetite and causing weight loss, said Cordain, also a Colorado State University health and exercise science professor. "Hence the tenets of the Rice Diet are inconsistent with the best science of the 21st century," Cordain said in an email. Rice Diet founder Dr. Walter Kempner's original goal in developing the plan in the late 1930s was to address deadly high-blood pressure, diabetes and heart disease before the advent of modern drugs. The plan resulted in serious weight loss, which led appearance-conscious celebrities of yesteryear to come to Durham for the cure. Kempner, who came from Germany in 1934, ran the Rice Diet from Duke University's medical center for years before it moved off campus. It was among the first weight loss clinics in the country where patients would go to one location for medical supervision, eating and exercise coaching, and gather for their meals. Under the rigid discipline of Kempner, enrolling in the Rice Diet residential facility was like entering boot camp for the overweight, said Jean Renfro Anspaugh. "One ate rice and fruit and walked. The staff didn't care what you thought, only what you ate and how often you exercised," said Anspaugh, whose book about her experiences with the program is called "Fat Like Us." Anspaugh, 59, of Fairfax, Va., knew of Durham and the Rice Diet from celebrities discussing weight loss on television in the 1960s. That's where she headed, dropping out of law school in Sacramento, Calif., within weeks after her excess weight collapsed a patio chair. She lost 70 pounds in four months on the Rice Diet, but ran out of money before reaching her target of another 50 pounds, and got a job with Kempner's team. She believes the Rice Diet Program suffered from the multiplying number of diet books, the difficulty having insurance cover time at a diet retreat and the popularity of gastric bypass surgery. "Why go to Durham and spend all that money eating rice and fruit and starving to death when you can go to your local hospital and have it done and have your insurance pay for most of it?" Anspaugh said. The diet earned millions of dollars for Duke University and helped its medical center establish a reputation as a pioneer in the science and psychology of obesity. Durham became known as one of the world's dieting centers as Duke University later opened its Duke Diet & Fitness Center, followed in the 1970s by the independent Structure House. A 2009 estimate put the value of those visitors at $80 million a year, but there are no more recent figures, said Shelly Green, president of the Durham Convention & Visitors Bureau. The medical center's executives had a long and fraught relationship with Kempner. Some details became public after one of Kempner's former patients sued him and Duke in 1993. Sharon Ryan alleged that between 1970 and 1987 the doctor whipped her bare buttocks with a riding crop when she violated Kempner's strict rules by gaining weight. Kempner said in a deposition he thought the risk to his patients' lives was so great if they deviated from his regimen that it warranted harshness. Five years after Kempner died, Duke severed its ties to the Rice Diet in 2002 and Robert Rosati, who had already been working with the program for nearly two decades, took it over. Robert Rosati did not respond to a request for an interview. In recent years, the weeks-long program that cost around $5,000 had been drawing fewer patients, Robert Rosati's son, Chris, said in an interview. Kitty Rosati declined to discuss the business's finances further. If the Rice Diet Program has left a void, John Aycoth is stepping in. He tried to buy the Rice Diet Program from the Rosatis, but now is launching a new venture in the city where the North Carolina native said he lost more than 130 pounds over two years of visits to the competing Duke Diet & Fitness Center. 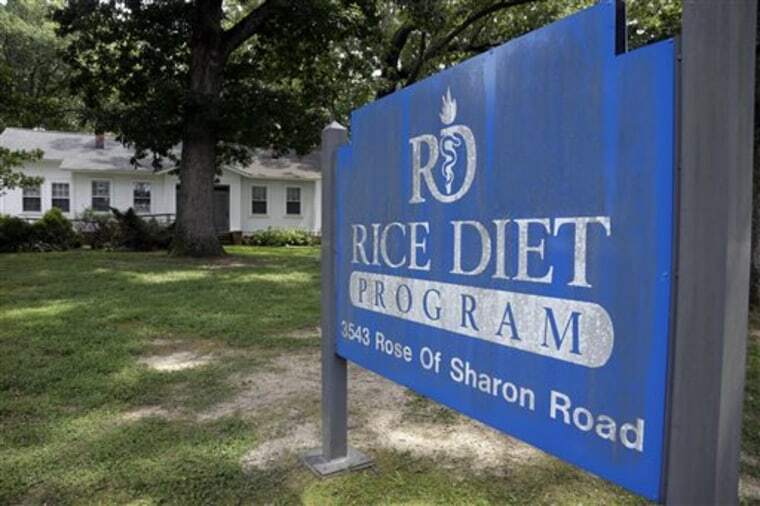 The former Washington, D.C., lobbyist is hiring many former Rice Diet employees and next month plans to open the Rice House Healthcare Program based on Kempner's principles. Aycoth said he is investing $1 million to buy a building, outfit it with a new kitchen and furniture, and hire Dr. Frank Neelon, the former medical director of the Rice Diet Program. Aycoth said he expects to recoup his investment in five years by charging cash-only patients $6,000 for their first month of food, classes and medical oversight. There's still a market for medically supervised diet clinics because obesity, and the serious illnesses that accompany it, has never been more prevalent from across America to rising middle-classes in the developing world, said Aycoth, who formerly lobbied for dozens of foreign governments. While gastric bypass surgery is effective, there are complications and risks including even the rare death, there may be long-term complications and patients still need to watch their diet and exercise, Neelon said. "You have to change your life anyhow," he said.